1,000 TOKENS - $349.00 POSTPAID! 100 different tokens of our choice. Price $37.50. 1,000 tokens, at least 700 different, no more than two alike. This is our best value! Only $349.00! #48 GREAT EVENTS IN THE AMERICAN REVOLUTION. 50 different tokens featuring great figures and events of the American Revolution. (Including the Stamp Act, Boston Tea Party, Declaration of Independence, Winter at Valley Forge, Mad Anthony Wayne, Treaty of Paris, et al). Price $29.95. #49 Set of 50 tokens featuring GREAT AMERICANS (Including Adams, Anthony, Astor, Audubon, Boone, Carnegie, Carver, Edison, Emerson, Foster, Holmes, Lee, Lincoln, Longfellow, Morse, Poe, Pulitzer, Thoreau, et al). Price $29.95. #50 Set of 50 tokens, GREAT EVENTS OF AMERICAN NUMISMATICS. A delightful collection memorializing just about everything from the Brasher doubloon to the Morgan dollar, from the Aluminum cent mystery of 1974 to the Pan-Pacific Exposition! Price $29.95. #51 AUTOMATIC MUSICAL INSTRUMENTS. The story of music boxes, player pianos, etc. memorialized on 50 different tokens. Price $29.95. The deluxe set is the largest number of different tokens we offer. It includes one each of everything we have - everything listed above from number 1 through 51 inclusive plus more than 50 additional tokens. Over 1100 different tokens in all! Regular price, if purchased as per above by states, is over $700.00 (not including the extra tokens). We offer you this fantastic collection, a group which will bring you many hours of pleasure, for only $549.00. You will get some fascinating tokens, nearly all of which have a mintage of no more than 1,000 pieces, in Choice Uncirculated grade, at a price that will save you over $150.00! The number of sets available with this many different tokens is strictly limited to the supply on hand. Currently this lot actually contains 1130 different pieces but that number will decrease as we exhaust our limited supplies of some tokens. Order soon to receive the maximum number of tokens we can supply! That's right, your net cost is only $549.00 postpaid! Commencing in 1976 and for the following three years the Patrick Mint was engaged in the production of 20 mm size copper tokens. These approximately nickel size pieces were struck using stock obverse designs of a wide variety while the reverses were personalized to the order to the customer. Many were done with the customer's name, address and phone number, making them business cards. Others were issued as "good fors", such as good for $10.00 off on the purchase of such and such product. Some others were issued in series such as Great Americans, Great Events in American Numismatics, etc. The obverses include different Eagle motifs, coin designs such as the Pine Tree Shillings and Shekels, Independence Hall, Twin Bells, as well as Indian Heads with various dates, etc. 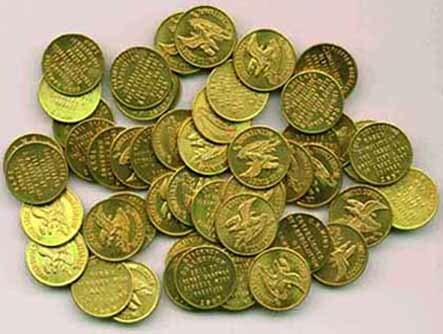 A large number of tokens were issued by coin dealers. The tokens were ordered by people all over the world although primarily were struck for people and businesses in the U.S. In all, some 1341 different tokens were made not including those made with more than one obverse type. The 949 different tokens issued during the U.S. Bicentennial in 1976 are catalogued and illustrated in The Bicentennial Tokens of The Patrick Mint which is still available from us for $5.95 postpaid. A new work encompassing the whole series is in preparation. The tokens which we offer are all overruns struck between 1976 and 1979 and are not recently made. The dies used to strike these tokens are long gone and no more can be made. All of the tokens have been sitting for a minimum of 16-20 years in cloth bags and remain in Choice Uncirculated condition. These tokens were discussed by Q.D. Bowers in his well know book Adventures With Rare Coins on pages 267 and 277. It is important to realize that in over 90% of the cases the mintage for these tokens was limited to 1,000 pieces. The issue of this series of tokens has ended and we have no plans of ever producing anything of this size again. The present offering is the last time these tokens will be available in such abundance and quite likely the last time they will be available this cheaply. They represent excellent value, primarily because they are being sold below the current cost to produce them. We hope you will try collecting them as they represent an inexpensive and interesting, as well as challenging series to collect. No one to our knowledge has ever completed a set of these tokens.